Good oral health is important to your pet's general health! Just as your dentist recommends routine dental cleanings to prevent disease of your teeth, it is also highly recommended for your pet to have routine dental exams and cleanings. According to the American Veterinary Dental College (AVDC), by the age of 3 years old, most pets will have some degree of periodontal disease. Most commonly, the only sign of periodontal disease that an owner recognizes is "bad breath". As a result, periodontal disease is often diagnosed late in the course of disease and may cause multiple problems in the oral cavity and may be associated with damage to internal organs in some patients as they age. Studies in humans have linked periodontal disease to a variety of health problems. Because our pets can't tell us when their teeth hurt or when there is a problem, it is important that they have yearly dental exams. All of our routine exams include a dental exam. If our veterinarians notice periodontal disease or have concerns, it is important to do a complete dental exam under anesthesia. Similar to a human dentist, your pet's teeth will be probed and evaluated to check for periodontal pockets, gum erosion, root exposure, and fractures, which may lead to tooth extractions. Anesthesia is necessary for all dental cleanings and so-called "anesthesia-free" dental scaling is not recommended by AVDC. When our own teeth are cleaned, we calmly sit in the chair, open our mouth when requested, and know to spit excess fluid to prevent from choking. 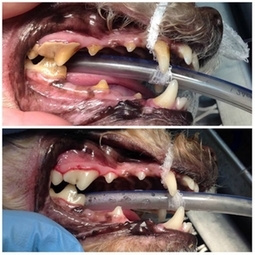 We also understand why the cleaning is important and rarely need sedation or restraint. This is not true for our pets. Additionally, we are able to tell the dentist which teeth or areas are painful. Our pets are not able to understand the exam and cleaning process and cannot communicate their aches and pains. For these reasons, it is important that proper anesthesia is performed so as not to miss anything and to protect the pet from inhaling fluid from the cleaning process. When necessary, in-house digital x-rays can be taken and reviewed instantly. These images can be very useful to detect fractures, infected pockets or root abscesses, broken roots left below the surface of the gum line, amognst other things. Statistics show that preventing diseases with regular dental checkups can extend your pet's life expectancy by two to four years.